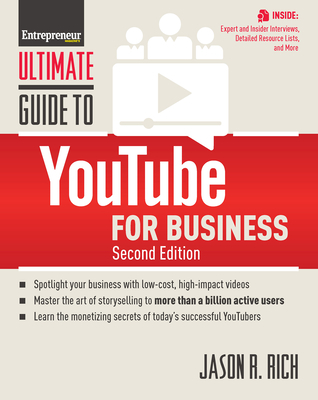 From video production to promotion, the experts of Entrepreneur Media and writer Jason R. Rich detail how to use the power of YouTube to promote business brands, products, or services, and ultimately, attract new customers. Readers receive a full tutorial on pre-production and production essentials from developing video ideas that attract attention to overcoming lighting and sound challenges. Amateur producers receive a full list of equipment needed, gaining tips from well-known YouTubers on how to produce quality spots without breaking the bank. After covering the basics, Rich, joined by YouTube savvy entrepreneurs, reveal how small business owners can drive viewers to contact their business. Readers learn: Strategies that make it easy for people to find their videos on YouTube How to promote their YouTube videos using Facebook, Twitter, Google+, and other social sites Methods for boosting a video's views using blogs, websites and other online resources How to start a successful YouTube channel How to make a video go viral What it takes to become a "YouTube Personality" that viewers want to listen to. For more than 30 years, Entrepreneur Media, Inc. has set the course for success for millions of entrepreneurs and small business owners. We'll teach you the secrets of the winners and give you exactly what you need to lay the groundwork for success. Jason R. Rich is the bestselling author of more than 40 books covering a wide range of topics, including computers, ecommerce, personal finance, career-related topics, and travel and entertainment. He also contributes regularly to major daily newspapers, including the New York Daily News, as well as national magazines and popular websites Jason R. Rich is the best-selling author of more than 40 books covering a wide range of topics, including computers and ecommerce. He also contributes regularly to major daily newspapers, including the New York Daily News, as well as national magazines and popular websites.